Apologies for the belated nature of the post, faithful readers. I took yesterday off, and when I take a day off, I take a day off. 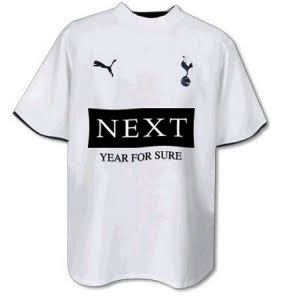 Anyway, I hope everyone had a fine Christmas holiday, unless you support Tottenham, in which case I hope your Hannukah sucked. Arsenal fans had extra reason to be cheery on Sunday as we toppled the in-form team of the moment in Villa at the Emirates, where the Villains had never lost. With us level on points and playing as well as they were, this was a crucial match for the Gunners, especially considering the wide-open nature of the title race and leaders Chelsea dropping points like an armless man in a juggling contest. I think we all breathed a little easier seeing that Cesc had at least been fit enough to make the bench, and in the early going it appeared his services wouldn't be required, as Diaby's physical work in the 18-yard box set up Eduardo, who took a beautiful turn to go one-on-one with Friedel, only to rush his shot and hit it lamely at the Villa 'keeper. A brilliant chance had gone begging. Arsenal controlled the early minutes, but the momentum shifted Villa's way, and Martin O'Neill's charges had the better of Arsenal for a good 10 minutes, creating a number of chances, and though they were unable to score, some of the stops were rather nervously done. At one point, Almunia nearly took the ball out for a corner without any Villa players around, although luckily this didn't come to pass. Still, Arsenal did weather the storm, and began making some more attacks at Villa's end. The best of these was set up when Eduardo took a ball on the right and crossed to Denilson at the top of the box, who really should have taken his shot. Instead, as though the ghost of Alex Hleb had possessed the Brazilian, he deferred to Nasri on his right, who fired over the bar. Scoreless at half-time was fair to both sides, and while Arsenal had control of the match in the second half, things had yet to truly get rolling. Ashley Young was booked for diving, meaning the Villa winger will miss his next match through yellow card accumulation. In this match he would continue, Arsenal winning a series of free kicks and corners that they were simply unable to convert. With Fabregas warming up to enter the fray, a corner ball bounced to Gallas in front of goal, whose attempt was blocked by Friedel. Cesc came on for Denilson (who appears to have reinjured his back), and everything changed. Immediately, Arsenal's attacks gained some bite, with penetrating runs and deft passing, less of the tippy-tappy feel of the first hour or so. A chance began with nice interplay between Arshavin and Eduardo bringing the ball up the left. In the box, Eddie's touch let him down, but a lucky break saw Dunne misplay an easy ball, Cesc jumped on the opportunity and slid it to Eddie, who wasn't able to put any power behind a desperate effort. 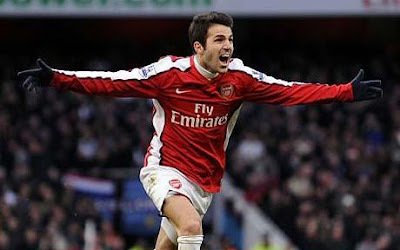 Shortly after, Cesc created another chance, picking out Arshavin, whose shot was stretched by a well-worked Friedel. Arsenal were rolling and Villa were decidedly on the the back foot. Cesc took a ball from Arshavin at the top of the box and was hauled down, referee Phil Dowd rightly awarding a free kick. Cesc took it himself and sent a gorgeous curling ball over the wall and into the left corner of the net, the Grove and Nevadas went wild, and Villa just looked broken. It was the second time in two matches that Arsenal had scored a free kick (Denilson had a cracker against Hull), and both broke deadlocked matches when taken. Cesc's presence had made a palpable impact, with Villa's vaunted defense forgetting all positioning sense to chase around El Capitan. 1-0 to the Arsenal, and there was still more to come. Villa took a few half-hearted attacks at the Arsenal end, each cleared with seeming ease, and at the end, Traore sent a long ball across the pitch to find substitute Theo Walcott running up the right, with Cesc keeping pace. Theo sent a lovely ball sliding into Cesc's path, and El Capitan Catalan Fantastico struck a beautiful ball past Friedel for his second. A brilliant bit of counterattacking play had secured the points for Arsenal, but the celebration was tempered a bit as Cesc limped off, seeming to reinjure his hamstring. We're all still hoping it won't be too severe, as we would certainly miss him (in addition to Song and Eboue away for the African Nations Cup) for some key matches in January if that were the case. Keep your fingers crossed, Gooners. Ramsey came on for the captain, the damage to Villa having been done. The visitors did get one more chance to grab a goal, with a long ball headed on by Carew into the path of the dangerous Agbonlahor, who battled Gallas into the box. Big Willie made a nice tackle to knock the ball away, but Agbonlahor sped toward the rebound, which was narrowly pushed out by a recovering Almunia, a good bit of keeping. The icing was added when Diaby took the ball at the center circle, and with a dazzling run, penetrated the Villa defense, finishing with a daisy-cutter taken from outside the box. This may sound crazy, but I believe Diaby is something of a Samson: shave his head = injuries and shity play; full afro = goals galore. 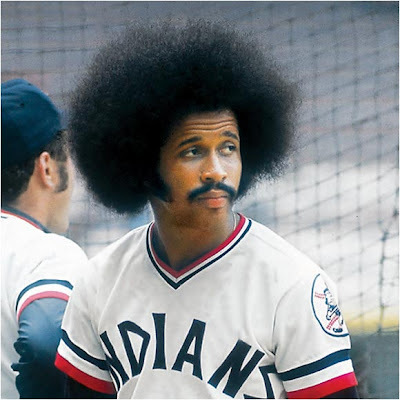 If that's what it takes, I want to see Abou rocking a full Oscar Gamble next time out. A 3-0 scoreline, a holiday gift from the Gunners to their fans, and all was right with the world. Apart from Cesc's hammy, of course. After the match, Arsene defended taking the risk of using a not-fully-fit Cesc in this fixture, and I have to agree with him. That's not to say we couldn't have won the match without him, but if the first 50+ minutes were any indication, it would not have been easy or pretty. The things that Cesc can do on the pitch are unmatched by any other player in the squad, and I would go so far as to say in the world. His vision is unparalleled, his touch is first-rate and his physical strength has improved as well, making him an even more effective weapon against traditional, plodding English defenses. So, with Chelsea being held to a scoreless draw at St. Andrews by the Brummies followed by a win over visiting Fulham, we are currently 7 points off the lead with two matches in hand. Win both and we're just a point back, and that's not much of a lead, is it? I'll not be reviewing my picks for last weekend, since so many more matches have already been played since, and there are certainly a fair few yet to come. But we do have a mid-week fixture away at Portsmouth, still securely at the bottom of the table with 14 points out of 19 matches. We tanned Pompey's hides when we played them in August at the Grove, gaining a 4-1 win. 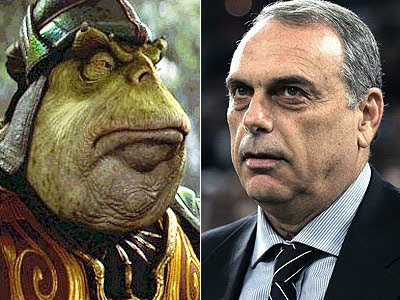 Things have been slightly better under new manager Avram Grant, as Pompey have gone 2-1-3 with him in charge. However, that kind of performance will need to improve for Pompey to stay up, the hole they've dug themselves being so deep already. Luckily, Cameroon aren't being total douchebags and forcing Song to join his national team so long before the African Cup of Nations begins, so he will be available for the Portsmouth match. Even without a Cesc in the lineup, we ought to have more than enough for Pompey, despite having to travel to Fratton Park. I imagine we'll see some of the Carling kids join the team as substitutes, and one would expect Aaron Ramsey, if not starting, to see significant action. I could definitely see an early Arsenal goal silencing the Pompey Chimes, but the lads must keep both eyes on the task at hand. Liverpool failed to look like playing the seasiders and walked away 2-0 losers to Pompey. Once Song is away, much will depend on the injuries to Cesc and Denilson for the lineup we put out there. The back line is fairly settled and up front we know what options we do have. In midfield, the question from early on of what we would do without Song in January will be revisited and Arsene's hypotheses for how to deal with the loss will be tested. We have a series of tough fixtures at the end of the January, so maximum points from every match in between will be required. Apologies again for the brevity of the post. We're at the time of year when the matches are coming thick and fast, so let's all hope Arsenal can weather the storm and come through looking good on the other side. Keep the faith, and above all, you stay classy, Goon Diego.